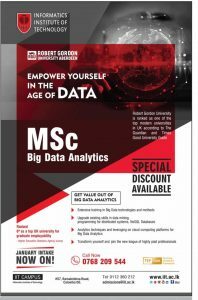 IIT Campus invites applications for the MSc in Big Data Analytics for January 2018 Intakes. The degree is affiliated by Robert Gordon University Aberdeen, UK. Robert Gordon University is ranked as one of the top modem universities in UK according to The Guardian and Times Good University Guide.